A London museum has airbrushed the signature cigar from the famous photograph of Winston Churchill giving his victory salute. The reproduction of the photo hanging over the main entrance to the museum has turned Britain’s celebrated World War II leader into a packed-up, pantywaist, politically correct non-smoker. The museum manager would not reveal who was responsible for the alteration and enlargement of the image. In the well-known original image, Churchill makes a “V” shaped symbol with his fingers – while gripping a cigar in the corner of his mouth. But in a reproduction of the picture, hanging over the main entrance to a London museum celebrating the wartime leader, he has been made into a non-smoker through the use of image-altering techniques. 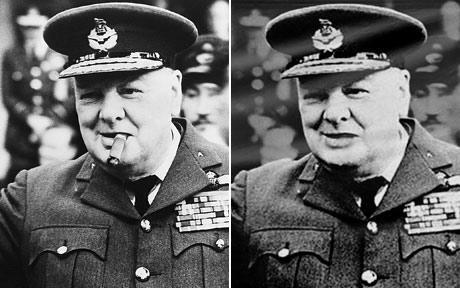 It is unclear who is responsible for doctoring the photograph, with the museum – The Winston Churchill’s Britain at War Experience – claiming not to have noticed the cigar was missing. John Welsh, manager of the museum, admitted he was shocked to learn of the alteration, but declined to reveal who was responsible for the display and for enlarging the image. The alteration of the original image, taken in 1948 during the opening of a new military headquarters, was noticed by David McAdam, a visitor to the museum. He told the Daily Mail: “I pointed out this crude alteration to a museum steward who said she hadn’t noticed the change before, nor had anyone else pointed it out. Alan Packwood, of the Churchill Archives Centre, said he was not aware of any previous case where Churchill’s cigar had been digitally removed from a picture. Hispanic voters in Port Chester, New York, recently elected the town’s first Hispanic trustee under a new cumulative voting system. Hispanic voters were given six votes each to distribute as they wished among 13 candidates running for the town’s six trustee seats. Port Chester’s population is about 30,000, of which nearly half are Hispanic, yet no Hispanic had ever been elected to a trustee position. Federal Judge Stephen Robinson ruled that the conventional election system violated the Voting Rights Act because white candidates always won. Robinson rejected the idea to divide the town into six districts, which included a heavily Hispanic district, and opted instead to adopt cumulative voting as the remedy. In addition, Robinson ordered in-person early voting, which allows Hispanic residents to cast ballots over a five-day period rather than just one day. Spanish language translators were stationed at the polls to explain the new system to Hispanic voters, while officials from the Justice Department monitored the process. “That was very strange. I’m not sure I liked it. All my life, I’ve heard, `one man, one vote. '”—Arthur Furano, an 80-year old Port Chester resident. Although cumulative voting is new to New York, it has been used to elect the school board in Amarillo, Texas, the county commission in Chilton County, Alabama, and the City Council in Peoria, Illinois. For more information on the cumulative voting story, see Residents get 6 votes each in suburban NY election by Jim Fitzgerald and New Voting System Shakes Up Election in Port Chester by Pei-Sze Cheng. We have created rules of engagement in Afghanistan which allows [sic] the enemy every opportunity to kill our men and women. We have considered such horrible ideas such as an award for “courageous restraint”. We even allow former Taliban members who have attacked, and maybe even killed, our troops to be released from detainment based upon a “pledge” signed by their fathers and tribal leaders. Greetings Wheels on the Road readers, fellow South Floridians, and indeed all Americans. It is time for our monthly political assessment and this one is rather personal. Last month we addressed what is at stake, and the response was the future of America. One of the factors affecting our Country right now relates to Alexander’s quote mentioned above. Attorney General Eric Holder once lamented that America is a “nation of cowards”, that is far from the truth. The problem we have in America is that we are being led by lambs, by an effete ruling class elite. America is a nation of lions, warriors, but when we find ourselves being led by a cabal of weak, ineffective, and indecisive appeasers the result is evident. Sure, the liberal progressives are dogged ideologues and tenacious poodles when it comes to nationalizing our production; healthcare, financial sector, energy sector, and automobile industry. They stand strong against the rule of law regarding illegal immigration. And there is no doubt no group will fight harder to redistribute wealth and turn America into a collective “balkanized” socialist Country. However, what scares the liberals more than anything else is the “Warrior Class”. They abhor the men and women who find a commitment and conviction in believing in this Constitutional Republic and the principles which make America exceptional. This is a sentiment which over the past 30 days we witnessed being manifested from the highest office in our land, the President. When Barack Hussein Obama made the decision to take a “vacation” back to Chicago rather than attend Memorial Day ceremonies at Arlington National cemetery that was a complete disregard and disrespect to those who gave the “last full measure of devotion”. I know, those who suffer from Bush Derangement Syndrome are frothing and recounting that Pres GW Bush missed an Arlington ceremony….but he was at Normandy, a very appropriate place to be. But it was not just the missing Memorial Day, it was also the lack of any recognition of the 66th anniversary of D-Day. It was the failure to address Flag Day which was also the 235th birthday of the US Army. Lastly, Obama’s refusal for the second year in a row to attend the “Gold Star Family” events clearly telegraphs his regard for our military does not go beyond photo opportunities. The malignant narcissism of the President, and the liberal progressives, is laser focused on the disrespect and the destruction of the American Warrior class. They detest anyone who has the courage of conviction and love of America, something which they find unconscionable. It starts with a national security strategy which refuses to address the enemy of our Nation, islamic totalitarianism and radical islamic state sponsored terrorism. We have sheep who are so oblivious to the threats to our security that the Obama administation’s terrorism expert, John Brennan, stated that “terrorism is a state of mind and jihadism is a legitimate tenet of Islam”. When at the highest levels we project a recalcitrance to confront our enemy, you only embolden them. When an enemy is emboldened, such as this one, they launch a “humanitarian aid” flotilla which is nothing more than a cover to supply a terrorist organization, Hamas. When you have a Sovereign State seek to protect itself, and even institute insidious rules of engagement, and yet is condemned for protecting its warriors, we are upside down……we are being led by sheep. Nothing pleasures wolves more than fresh lamb meat, and we are serving that up at every instance. This seemingly is not just an American phenomenon, but a worldwide epidemic. North Korea sinks a South Korean naval vessel and we ask for an apology. The international community demands that Israel apologize and submit to an investigation. We have created rules of engagement in Afghanistan which allows the enemy every opportunity to kill our men and women. We have considered such horrible ideas such as an award for “courageous restraint”. We even allow former Taliban members who have attacked, and maybe even killed, our troops to be released from detainment based upon a “pledge” signed by their fathers and tribal leaders. Yet, we have our own Warriors such a Army 1LT Michael Behenna serving a 15 year prison sentence for killing a known Al Qaeda operative who attacked him. Worse however, is the fact that exculpatory evidence in his case was withheld by the Army prosecutors who also withheld a key witness. There in the military prison at Ft Leavenworth sit 10 Army Soldiers while Taliban fighters are being released. We just witnessed some of our finest Warriors, US Navy SEALS, having to endure a courts-martial because they “punched” a terrorist. That is why I will be heading to Ft Leavenworth in September to rally for the release of our Soldiers so that they can be reunited with their families. Those families who willingly sacrificed their loved ones, believing that they could be severely wounded, or even killed….but never imprisoned for doing what we ask Warriors to do. In the past 30 days we watched the House of Representatives so concerned about the military that they just could not wait, and voted to repeal “Dont Ask Dont Tell”. This was done against the counsel of the Service Chiefs who asked for an opportunity to allow the men and women in uniform to offer their suggestions and insights. No, it is more important to have the military accomodate behavior rather than respect the professionalism of those Soldiers, Sailors, Airmen, Marines, and Coast Guardsmen. We have seen the President nominate someone for Supreme Court justice who attacked the Solomon Amendment, allowing ROTC activities on our college campuses. We are willing to allow an Islamic victory tribute to be erected at Ground Zero in New York City because we have leaders who just cannot find the courage to stand….sheep. We have a running gun battle occuring on our southern border but we allowed a foreign leader to demean our laws and attack a Governor of a sovereign American State. There has never been a more critical time for our Republic and yet we find the worse possible individuals in control for this time. We have a Nation of men and women who embrace victory and detest the stench of defeat. However, all we get is more speeches, talk, empty rhetoric, and never an action plan….at least not an action plan which is commensurate with the foundational principles of America. I stated earlier that this subject is personal to me and that is because of my story from Iraq in 2003. Yes, I fired my service 9mm over the head of a detainee to ensure my men were protected. Yes, I was removed from command and fined $5000. Yes, I withstood the attacks from the liberal sheep and will continue to do so because I am part of the Warrior class. I retired with Honor and remain a respected member of that group of men and women who feel pride when the National Anthem is played, and tear up at Taps. When I look at Pelosi, Frank, Weiner, Clyburn, Klein, and Obama I see lambs, certainly not leaders. I see mundane deliberators, not decisive people of character. This 2010 election cycle has the most Veterans running for office since WW II and there is a simple reason. America will not survive as a Nation in a world of wolves being led by sheep, it will take Lions. Brother O proposes to give away 400 million taxpayer dollars to the terrorist organization Hamas for “humanitarian aid” to Palestinians in the Gaza Strip area. Brother O and congressional Democrats obviously trust the terrorist organization to direct the taxpayers’ money to needy Palestinians and not use it to promote terrorism and murder Israelis. Yet Hamas has not rescinded from its Charter the call for the annihilation of Israel or any of its extremist statements regarding Jews; therefore, it’s highly unlikely that needy Palestinians will receive a goodly percentage of the taxpayers’ money. As they did in the flotilla incident, Brother O and the Bread and Circuses administration side with Israel’s enemies once again. What’s it going to take to convince a bunch of stiff-necked American Jews that Brother O and the Democrat Party are indeed enemies of Israel? Will Our Money Go To Hamas? We are $13 trillion in debt. We will be $19.6 trillion in debt come 2015. Yet, the President wants to send $400 million for “humanitarian aid” to the Palestinians in the Gaza Strip, an area controlled by the terrorist organization Hamas. As well intentioned this offer may be how can we be sure our money will not be used to fund terrorist activities? Well, we can’t. If the money given to the late PLO chief Yasser Arafat is any indication, our dollars will be used to fund more terrorist activities and line the pockets of those in charge. Moreover, people have been sentenced to prison for funneling money to Hamas under the guise of “humanitarian aid,” so it’s a bit peculiar that our government would send money under the same conditions. Before one dime is handed over to the Palestinians, Congress needs to do its due diligence to ensure there are safeguards in place to prevent money from being used for terrorist activities.